144,929 tummy tuck procedures were performed in 2010, making it the fourth most popular cosmetic enhancement procedure, according to the latest statistics from the American Society for Aesthetic Plastic Surgery (ASAPS). Dr. Steven H. Turkeltaub, a board-certified plastic surgeon in Arizona, discusses the 13.3% increase compared to 2009, as well as the fact that a majority of Americans now approve of cosmetic enhancement. More than 9.3 million cosmetic enhancement procedures were performed in 2010, which is a 9% increase from 2009 according to the most recent data from the American Society for Aesthetic Plastic Surgery (ASAPS). One of several reasons for this increase is an even greater acceptance of cosmetic surgery, which has become increasingly mainstream, says board-certified plastic surgeon Dr. Steven Turkeltaub. He adds that a slightly improved economy following a deep recession with pent up demand has played a significant role in this increase as well. According to the ASAPS study, more than half of all Americans now approve of cosmetic enhancement. 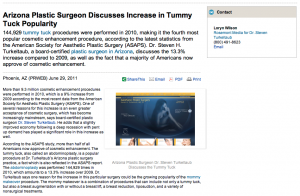 The tummy tuck, also called an abdominoplasty, is a popular procedure at Dr. Turkeltaub’s Arizona plastic surgery practice, a fact which is also reflected in the ASAPS report. The abdominoplasty was performed 144,929 times in 2010, which amounts to a 13.3% increase over 2009. Dr. Turkeltaub says one reason for the increase in this particular surgery could be the growing popularity of the mommy makeover procedure. The mommy makeover is a combination of procedures that can include not only a tummy tuck, but also a breast augmentation with or without a breast lift, a breast reduction, liposuction, and a variety of nonsurgical treatments. Dr. Turkeltaub says Americans simply want to look as young as they feel and a tummy tucks is one of the procedures in the right person that can provide these results. If the economy begins to show more significant improvements, Dr. Turkeltaub says he expects the number of patients seeking a tummy tuck along with other cosmetic plastic surgery procedures to continue to increase substantially. Dr. Steven Turkeltaub earned his medical degree from Boston University and the School of Medicine. He completed his general surgery residency at the University of Miami/Jackson Memorial Hospital and the Northwestern Medical Center, followed by his plastic surgery residency at the University of Massachusetts Medical Center. Dr. Turkeltaub is a member of the American Society of Plastic Surgeons, the Arizona Society of Plastic and Reconstructive Surgeons, and the Arizona Medical Association. Continuing medical education is also extremely important to Dr. Turkeltaub because it allows him to stay on the cutting-edge of plastic surgery. The Arizona Center for Aesthetic Plastic Surgery is located at 10290 N. 92nd St. Ste. 207 in Scottsdale, AZ 85258, and can be reached at (480) 451-3000, or found online at either turkeltaub.com or the Plastic Surgery Arizona – Dr. Steven Turkeltaub Facebook page.